About 3,600 years ago a cataclysmic volcanic eruption occurred in the South Aegean Sea in an area which first became volcanically active around 3-4 million years ago and where eruptions continue to this day. The devastating eruption, in the view of some, may have been the largest volcanic eruption in the last few thousand years on Earth and certainly was the most important event in the Aegean before the fall of Troy. Some believe its effects led to the collapse, on Crete, of the Minoan civilisation. Santorini, the southernmost member of the Cyclades group of islands lies about 200 Kms. southeast of the Greek mainland, and is all that remains of a populated island which was destroyed by the eruption. It now is, in effect, a large water-filled caldera forming a protected bay, surrounded by 300 m. high, steep cliffs on three sides. The caldera is so deep – 400 m. – that ships generally are unable to anchor in the bay and cruise ships use their engines to hold their positions in the cone of the caldera. Several years ago a cruise ship came to grief in the caldera. Although Santorini has an airport most visitors come by boat. Backpackers and other wanting to spend time on the island to visit its significant archaeological sites use inter-island ferries and disembark at the ferry port Athinias, while passengers on cruise ships are taken by tender to the Old Port at Skala. From here they can go up to Thera (Fira), the main town on the island, by cable car, by car on the switchback road, by donkey on the donkey trail or on foot. The cable car, in a trip that takes 3 minutes, connects the port to Thera. It can carry 1,200 people per hour. 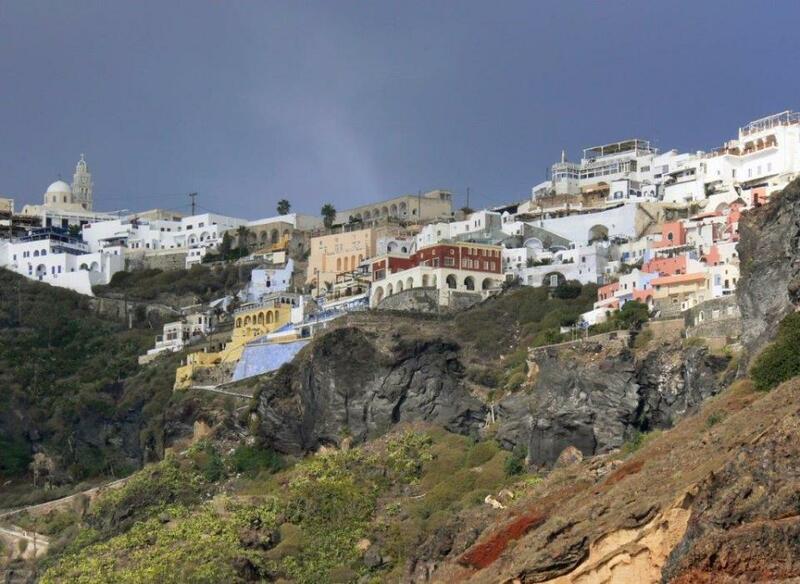 Thera and Oia (the oldest settlement on the island) are the two main towns. They are built on the crest of the caldera - as are smaller settlements and individual houses. 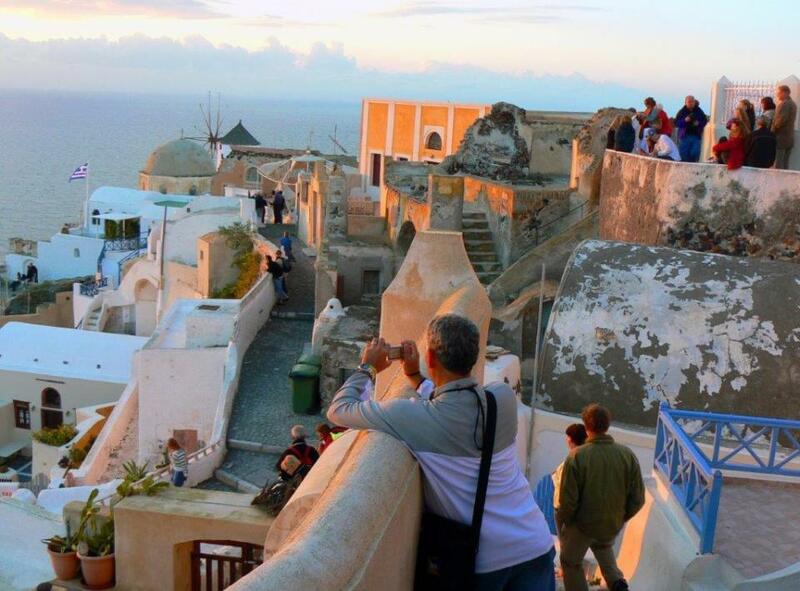 Oia is an attractive village on the north-west edge of the island extending for about 2 Kms. along the northern crest of the caldera at a height of 70 to 100 m. above sea level. Houses are built on the steep slope into niches carved into the rock on the seaward side. In the town itself there are narrow passageways, a central square and white washed blue domed churches. Spectacular views of the sunset over the caldera attract tourists. On 9 July, 1956 an earthquake caused considerable damage and many inhabitants left the town so that by 1977 there were only 306 people remaining. The town has since been redeveloped and now attracts tourists to a “picture perfect” destination in the Cyclades. A walk along the edge of the caldera from Thera to Oia is a rewarding way to spend a morning on Santorini. Copyright George Repin 2016. All Rights Reserved.